Die Schwalbe 2000 is a Stormbirds.com website. "The spring sunlight glittered upon the gray waters of the North Sea far below as Major John C Meyer, commander of the 352nd Fighter Group, led by his P-51D Mustang fighters towards their rendezvous with a formation of American heavy bombers en route to Germany. They were nearing the Friesian Islands when a flight of three twin-engine aircraft were sighted some way below. Meyer decided to investigate and, taking two sections of Mustangs, eased into a dive. Then it happened; the three aircraft suddenly picked up speed and pulled steadily away from the pursuing Mustangs. As the American pilots opened their throttles wide the unidentified aircraft lifted and climbed with unbelievable speed until they were lost to view in the blinding light of the sun. The Mustang pilots were left doubting the evidence of their own eyes." There is no doubt that the Me262 jet fighter was an amazing and awesome aircraft, far beyond its years, and devastatingly destructive. The origins of the Messerschmitt Me262 were born out of Germanys need to evaluate other forms of propulsion other than piston, when the Treaty Of Versailles forbade Germany from developing further aircraft technologies. Rocket and jet propulsion were not clauses in the treaty due to be thought of as folly; only past-times for the rich and eccentric, hell-bent on danger and publicity seeking. Indeed, many early developers of such powerplants became unfortunate victims of their own curiosity, as many were killed during their `experiments`. In Britain, however, a young ex Royal Air Force pilot named Frank Whittle, was experimenting with a large gas-turbine engine. This design, the W-1, was to become the worlds first fully-working jet engine. Whittle found it very difficult to get his design seriously recognised by the British Technical Establishment, and the `laxity` of the inter-war years, showed no urgency for his work to be given priority. This was to prove a fatal mistake for the British in the race to get a fully operational jet-powered aircraft into the skies. Whittles engine was eventually given recognition in 1941, when a new airframe was developed around the engine. This aircraft was the E28/39 which first flew from Farnborough on the 15th May of that year. The aircraft flew at speeds of up to 334mph. Thus began the Allies foray into jet power. The delays which hampered Whittle had proved to be a distinct advantage for Germany. The newly installed Nazi régime had become seriously interested in developing new forms of propulsion for its fledgling Luftwaffe, and in the run up to the outbreak of war in 1939, 2 jet-engine designs had been submitted to the Reichsluftministerium in Berlin. One design was by powerplant designers BMW, and the other by aircraft designers Junkers. To this end, a directive was issued in 1938 to all main players in the German aviation industry, which called for ` a fully jet-powered fighter design incorporating a swept wing`. The main player in the race to get a jet powered fighter airborne was Heinkel. 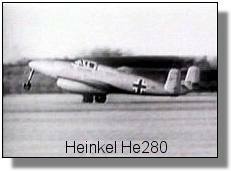 Heinkel's design, the He280, was the worlds first purely jet-powered aircraft. The design was the most advanced of its day, and flight trials were very promising. Two things though, hampered the He280 submission. These were the Nazi's insistence that Heinkel should concentrate their energies on their bomber aircraft, namely the He111, which was becoming Germanys premier mid-range bomber; and the other was that Ernst Heinkel wasn't in particular favour with the Nazi Hierarchy. The 280 was doomed. One man who was very much in favour was Wilhelm Messerschmitt, and his preliminary design was accepted as a test bed for the new BMW003 powerplant. Ironically, the airframe, designed by Dr. Woldemar Voigt, was complete BEFORE the new jet engines. So, on the 18th April 1941, the first Me262 (V1)Werke Nr.42012, flew from Augsburg, with a 750Hp Junkers Jumo 210G piston engine mounted in its nose. Speed attained in this flight was 450km/h. The original 262 was a `tail-dragger` design; the nose wheel was a development of a later prototype. The new BMW engines became ready for airframe installation in November 1941, and on the 25th March 1942, the 262 flew with BOTH its 2 BMW jet engines, and the trustworthy Jumo 210G upfront. This was, however, unintentional foresight on behalf of Messerschmitt's team, as during this flight, both BMW engines failed due to compressor blade failure, leaving test-pilot Fritz Wendel to land the plane solely under piston power. The BMW engines, which were proving to be extremely unreliable, were now cancelled out of the Me262 equation, therefore Messerschmitt continued the development of his aircraft using the new Junkers jet engines, the Jumo004 (known as the T1 engine). These engines had previously been tested under the wings of the Bf110 during their trials. A match was made. These new jets were more powerful than the old BMW ones, producing over 2000lb of static thrust each. They were also a LOT more reliable. 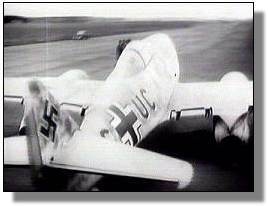 Me262V3 (PC+UC) immediately after her maiden flight, 18th July 1942. Test flights were conducted using a combination of both piston and jet power again, and on the 18th July 1942,at Leiphein airfield near Ulm, the Me262 flew solely on jet power, heralding in the dawn of a new era in aviation. 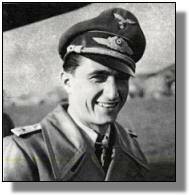 The pilot again for this flight was Fritz Wendel. This was Me 262 V2, Werknummer (WNr) 262 00002. The powerplants were designated Jumo 004 A-0. There was a problem with takeoff because of the undercarriage having a tail wheel. A ground crewman suggested to Fritz "When you reach 180 km/h tap the breaks lightly" ( to lift the tail). He thought it was a good idea. He did it and so he succeeded in taking off. After a 12 minute flight he returned and had much enthusiasm for the aircraft. He had reached an altitude of 2000 meters and a speed of 600 km/h. Control and the engines worked smoothly. On the next flight that afternoon he reached 3500 meters, a speed of 720 km/h and a climb rate of 5-6 m/s. There was a problem with the landing speeds because of the airflow over the wing center sections. The leading edge was therefore extended forward on the V3, after wind tunnel tests suggested this solution. The problem was thus amended. The takeoff run was also shortened by 380 meters. The wings therefore got the straight sweep instead of the slight crank on the V1, which had a greater sweep outboard from the engines that inboard from the engines. The performance of the 262 in trials was incredible. Test pilots were flying at speeds only pilots of the best piston-engined fighter could even dream of. And this performance typified every flight the Me262 made. The 262 project then went through a period of intense evaluation, but Allied bomber attacks on industrial centres in Germany prevented the 262 from immediately going into full scale production. In late 1943, with the Reich coming under more frequent attack from Allied bombers, Hitler ordered the Me262 to be put into full scale production, stripping the tooling from some factories, and replacing it with the new Messerschmitt jigs. By now, the Reich's war production was becoming severely disrupted, and a shortage of the new Jumo004 engines became a prime factor in the downfall of the 262. New aircraft designs submitted by the likes of Arado and Heinkel, to the RLM in Berlin, called for the new Jumo also, thus temporarily bleeding the already limited supply dry. The new BMW004 engine was by now in production, and mostly, new designs tendered had to use this new powerplant in order to alleviate Junkers already stretched demands for the 262 design. This, coupled with the insistence by Hitler that the new design should be used offensively as a bomber, instead of defensively as a fighter, caused severe problems to the already burgeoning project. Hitler, even under extreme pressure from Messerschmitt himself, Generaleutnant Adolf Galland, and Hermann Goering, could not be reasoned with and as a result Galland fell from favour with Hitler. The worlds first squadron, comprised entirely of jet fighters, was the Kommando Nowotny headed by Major Walter Nowotny himself. The first kill accredited to a Me262 was on the 25th July 1944, when a photo-reconnaissance Mosquito was attacked over Munich. Ignoring the insistence of Hitler, most airframes were completed as fighters instead of bombers, and when Hitler was informed of this he flew into a rage, grounding all current 'builds' in order that they may be continued as bombers. If the aircraft was allowed to be produced as a fighter, there may have been some time bought by Germany, as the Me262 would have been used to stave-off allied bomber formations which were pounding Germanys industrial heart. This was not to be. Instead, allied bombers wreaked havoc on aircraft production centres, causing some 262 production to be transferred to rural and woodland areas. It wasn't to be long before allied intelligence found these rural production centers, usually housed under camouflage tarpaulins, and ordered bombing raids. Of all those who encountered the 262 the reports were the same. Allied pilots were in awe of the new jet, and had deep respect and fear of it. On the pilots side, the 262 was beautiful to fly albeit not very responsive to throttle control. When attacking any bomber formation, pilots had to think well in advance and act quickly as failure would result in the jet 'over shooting' the formation due to its comparatively incredible speed. This actually did become a hindrance to attacking pilots; but the merits bestowed upon the 262 far outweighed it's disadvantages. It must be hard to imagine the delights of fighter pilots who were given such machines to fly. 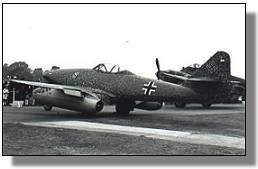 Altogether between 1400 and 1500 Me262's were built, or in some form of construction at the close of the war. Out of this number, only about 300 saw active service. The remainder were grounded due to either fuel shortages, conversion to bomber status at Hitler's command, spare parts, or more importantly-trained pilots. As the allies took over aircraft factories, several and wind tunnel models for advanced versions were already underway. Big things were certainly planned for the 262. Some bomber and fighter bombers had already been built and were in active service, along with radar equipped nightfighters (Nachtjagers). A number of 262's were fitted with a long nose cannon which would fire 50mm shells into bomber formations from long distance, and even rocket powered versions using the Walter rocket, the Me163 powerplant, were used. If the 262 had entered active service perhaps 6 to 8 months earlier, the tide of the war may have been changed, or at the very least, extended past 1945. We will never know for certain. We do know, however, that the 262's legacy continued well into the cold war period: the North American F-86 Sabre employed a wing design that was derived from advanced studies which the Germans had conducted during the Me262 project. © 1999 CastleWeb, in cooperation with Sabre Design Group.